The cultural twin towers of Edinburgh and Glasgow act as a civilizing parenthesis on the east and west coasts of lowland Scotland, ensuring that music fans are never far from a show. Between the two cities there more more than a hundred live music venues. But drive 10 minutes from the last bus stop on the outskirts of either city and you’ll find yourself in the rugged purple and green hinterland, a live-music wilderness. Drive along the A9 and the signs offer the choice of “The North” or “The South.” Head north. The roads slim down and the silence thickens as you wind past small villages pooled in the bottom of valleys. The tourists may be right, the vistas are the fodder of postcards, but while visitors pull off the roundabouts to take pictures and visit whiskey distilleries, the peace and quiet can weigh heavy on music fans and teenagers who live a few more exits off the main road. The internet can bring an album into their bedrooms, but the sweat and sound of a live gig are much further than a click away. 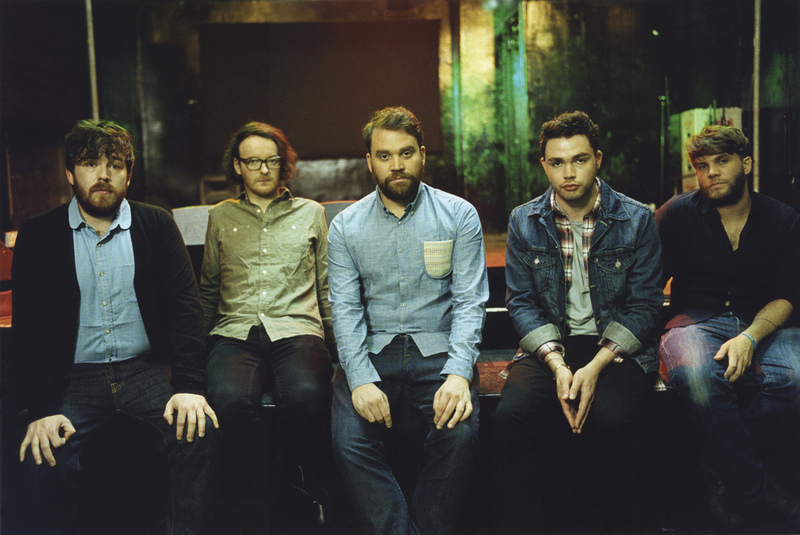 Scott and Grant Hutchinson of the Scottish rock band Frightened Rabbit grew up four exits off the A7 road, in the Scottish Borders’ town of Selkirk. In 2008, the band released their debut album, a bitter and vicious breakup record called Midnight Organ Fight. From the very first line of album opener “Modern Leper” — “Vital parts fall from his system / and dissolve in Scottish rain” — Scott established himself as a vivid lyricist with an unvarnished delivery. The songs trafficked in bleakness and misery, tempered only by a wry, sardonic sense of humor. The confessions of a tragic and deeply flawed hero found a wide audience, particularly in the US, and 2010 found FR trying to double down on success. The Winter of Mixed Drinks was a heavily produced, radio-ready album that expanded FR’s fanbase yet came across to diehards as a bit overwrought. The boys took note of the criticism. As they prepped for 2013’s Pedestrian Verse, they stripped back the production and wrestled with the songs live before finally putting them to record. Over 11 dates in 2012, an experience captured in “Here (The Highlands Film),” the band and a film crew wound its way through places where tourists don’t normally go in Scotland, to Ullapool and Stornoway, and tested the album in cafes and spa pavilions and on the floor of the Old Bridge Inn in Aviemore. So it was finally time for the Highlands Tour, was it? The whole point of us doing this was that bands don’t go through these tiny towns. You could tell that because the crowds were kind of mental. It was a big thing in every town we went to. Most shows were sold out. These places are difficult to get to. You needed a few ferries or you would be driving for 45 minutes on a single track road to get up to the venue. We felt slightly ashamed to visit some of the places, you know, being from Scotland, and never having visited there. Once the gig was over and you’d packed down, and we didn’t have a lot of stuff because we did it stripped back, you went to the pub, and everyone who had been at the gig was at the pub. It was a community experience, polite. After years of constant touring, what was reinvigorating about this particular tour for you? Turning up to a venue and having to work with what was there. In some of these places Scott had to play by himself because it was just a tiny pub. We had no idea what the venue would be like each time, but it worked out every time. It was nice, seven Scottish people, driving around our country, seeing places we hadn’t seen before. We had the filmmakers there from Northern England and to see their reactions to some of these places just made you proud. Scott often writes about Scotland’s grimmer side. How does that sometimes bleak view on life fit into your cultural identity? The Scottish identity, it is a very deprecating combination. A lot of people see it as negative. I think we’re just realistic. Everything we do has a sort of dark humor, but it can be very poignant when it needs to be. For this new album specifically, we worked and wrote together. We rented a house up north in Kingussie and also in the south of Scotland and we spent about 2-3 weeks in each. We holed up there, didn’t know anyone in the town, and we took a lot of inspiration from that. It has been nearly a decade since FR came together as a full band. How has the band changed? What we’ve always done is look back at the previous record or release and identify what we did wrong and change it so that we don’t do that again. Going into Pedestrian Verse, we were aware that we had maybe gone a little overboard with the sound on Winter of Mixed Drinks. Essentially, in an attempt to make a big sounding album, we threw everything at it. We tried to make an album that sounded big, by making it physically big, and layering parts upon parts upon parts. And that’s something that we were very aware of as we started writing and going into the studio. The shape is harder than anything in music, the knowing when to stop, that’s a huge difficulty. You play drums. Your brother fronts the group. What’s it like, being two brothers in the band? Yeah, we get pissed off every once in a while, then it’ll be done for a little, and then we explode. You just have to move on. We had our latest bust up at SXSW, purely because we had had too much drink. It’s a stressful experience, but the next day you try to get on with it. What was the most memorable bit of this past tour for you? I spoke to more than a few kids who this was their first gig, and that was obviously exciting. One that I do remember a lot was the Bridge Inn in Aviemore. We weren’t even on a stage. The crowd was climbing anywhere they could get, so that they could see. It felt like the crowd was towering over us. Folks were standing on chairs and they were on the speakers. We hadn’t played on the floor in a long time. And it wasn’t in a raucous way, everyone just wanted to have a look and see. Nathan Martin, formerly a reporter in Mississippi and an editor at the Washington Post Express, works at an education technology company and was married just outside one of those small Scottish towns up North.